I am not complaining about the weather. Oh Alberta weather Gods, I do not want to make you mad so no, I am not complaining. I actually DO love the hot weather, I am a beach girl, love the heat, the water and the summer, every single bit of it. I don’t like cooking in the summer, I really, really don’t. If I bake, it’s in the morning and then I still get a little cranky that I heated up my house. Cooking? Phht. It’s basically BBQ or stove top and even the stop top makes me a little cranky because of the heat it adds to the house. When the time came to whip up another Patak’s recipe, I knew that I was going to use as little heat as possible to cook whatever it was that I was making. 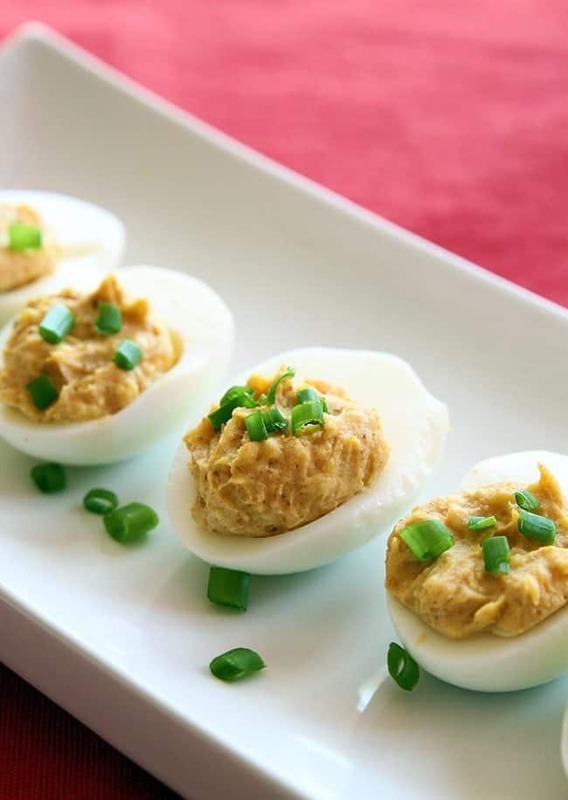 Funny enough, curried deviled eggs have been on my to-make list a long, long time. I absolutely love egg and curry together and I also love cold curry dishes. 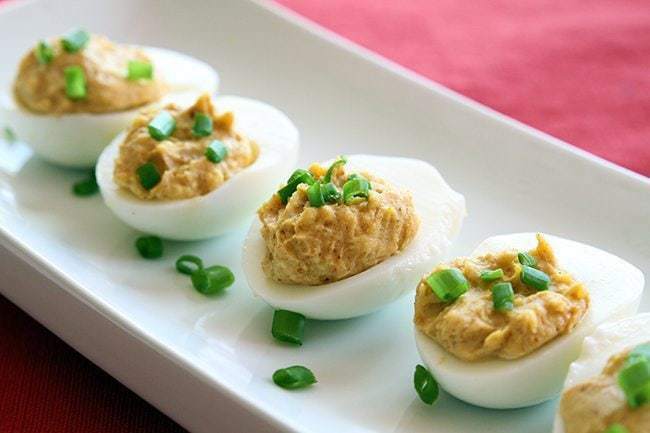 Everyone usually associates curry with heated dishes and while most of them are, cold curry dishes such as my deviled eggs are seriously the bees knees in the summertime! Did I also mention that they are 5 ingredients? Now I used Patak’s Hot Curry Paste because the egg and the mayo are such cooling foods, but if you don’t want the heat, use their mild paste instead. A word of warning: do NOT leave out the sugar. Trust me. The mayo and curry paste are too bitter on their own, the sugar makes them perfect! PIN THIS RECIPE to your APPETIZER RECIPES Board and Remember to FOLLOW ME ON PINTEREST! Place the Patak's Curry Paste in a small dish, heat in the microwave 60 seconds, in ten second intervals, to release the flavors. Stir every 10 seconds. This cooks the spices and releases the flavors. Set aside to cool. When the paste has cooled slightly, combine with the mayo and the sugar, then add to the egg yolks, combine completely. Fill each hollowed out egg with the mixture. Garnish with green onion and place in the fridge to cool. Yummy! I’m trying this one out. LOL! I rarely eat much for breakfast, funny enough, unless I am up for hours. Usually an apple/ fruit and 2 boiled eggs, that’s it! I can’t really eat until like brunch/lunch time. I’m weird.